I doubt it occurs to most people that they could control their minds. Someone who’s angry or upset, even if they’re miserable, is not going to react well to being told that they don’t have to be that way, that they only think they do. In fact they’re likely to argue in favor of their misery, saying so and so did this or said that, or such and such happened, and therefore they have no choice but to feel the way they do. In theory at least, we are free to think whatever we want, or not to think anything at all. The natural condition of the mind is clarity and openness, like empty space. But that original clear awareness gets lost under the weight of habitual reactions and patterns of thinking that have been acquired over time. Wrestling with thoughts, analyzing them and trying to change or eliminate them, is exhausting and usually leads to even more thinking. Simply letting go of thoughts, ignoring them as they come up, is more effective — as anyone who meditates eventually discovers. It’s said that it’s natural to have thoughts when meditating — just don’t invite them in for tea. It can take considerable time in meditation before thinking finally runs down and the mind returns to its natural default position of clear open awareness. When that first happens, even if only momentarily, it’s likely to be intense and blissful, even earthshaking. But just as nature abhors a vacuum, thoughts come roaring back with greater force in the wake of such an initial experience. Then the only course is to continue patiently letting go of thoughts again, not following them or provoking more thinking in response to them. This has been compared to shoveling away manure as it keeps piling up. It’s pretty much the essence of meditation practice. Thoughts are difficult to control because consciousness is not actually separate from a thought. For all practical purposes we ARE each thought as it arises. There isn’t a separate awareness somewhere that can “watch” when a thought actually occurs. That’s why it’s so easy to get “lost in thought” and frustrating to try to get control of thoughts as they happen, one after another. Despite how difficult it can be, if one persists in letting go of thoughts, moments of clear awareness eventually become more frequent and commonplace, and a certain distance opens up between thought sequences. With long consistent practice that awareness becomes easier to find and return to. Then thoughts and patterns of thinking can be clearly seen, even if only in retrospect. That doesn’t guarantee that negative thoughts such as egotism and anger won’t keep occurring in response to external events. But at the very least they can be let go of more quickly when they do come up. With practice, habitual thought patterns begin to lose their power over the mind. Awareness is usually identified with an individual self, separate from everything else. But that belief is misplaced. What’s separate is the mental and physical phenomenon that make up an individual life. Awareness itself is neither separate or not separate, existent or non-existent. When it’s relaxed and turned inward it’s clear and open, devoid of characteristics. Most thoughts revolve around the idea of a separate self. Although it’s merely an habitual pattern of thinking, without any ultimate reality, such a seeming separation is the cause of much suffering and distress. Suzuki Roshi used to say that we should put our faith in nothing. I’d go even further and say that we should also “identify” with nothing. The way to identify with nothing is to simply let go of external concerns and return to our ever-present clear awareness. Although it’s nothing, it turns out to be the source or essence of everything, past, present and future — while still remaining transcendent and undefiled. The word Tarot can be translated as The Book. “Reading” the Tarot, usually refers to its use in fortunetelling, but the Tarot can also be read much like one might read a book — with an eye to gaining knowledge. 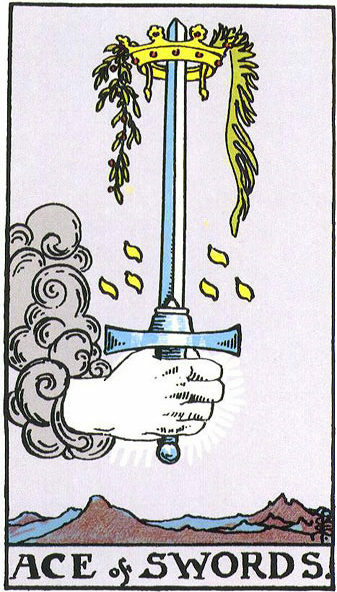 The Ace of Swords (Ace of Spades in a conventional deck), like all the aces in the Tarot cards, is the essence of its suit. Swords represent the element air, which symbolizes the mind that thinks and discriminates. It’s one of the traditional four basic elements, along with Coins (earth or matter), Cups (water or emotion) and Wands (fire or spirit). I find it interesting that the thinking mind is represented by a sword, and a two-edged sword at that. The fact that the word “word” appears in “sword” is even noteworthy in the quirky way that puns and associations can take on illogical, parallel meanings in occult speculations. Swords are by far the most malefic of the four suits. That the Tarot should view the intellect in a negative light is consistent with most mystical systems, especially meditation practice, where thinking and discriminating is seen as an impediment to insight. Words are indeed like a two-edged sword in the way they cut up reality into concepts, which tend to be dualistic, especially when applied to ourselves and the world. Every duality is like a sword with two sides. Although opposites, they’re actually the same sword, or one thing. Extremes such as egotism and self-love are the flip-side of insecurity and self-loathing. Both dissolve like clouds in the sky when the sun of clear awareness comes up. As long as we attempt to understand reality with thinking and analysis we end up stuck in dualities like self and other, inner and outer, absolute and relative, one and many, and so forth. It’s a way of discriminating and organizing reality, but not reality itself — just inadequate ideas about it. Thus it’s been said that we don’t function in reality, but a mental approximation of it. This trend is only accelerating with the advent of computers and the internet, that are extensions of our own mind. Nice post. I think that letting go of habitual thinking like this brings about changes to the brain. It allows new pathways to develop and new links between different areas of the brain. Eventually we get to a situation where we start to see things in a different way. Long term, this is most powerful when we let go of the new ways of seeing things too. You are a real Buddhist.